Our follow up to “Skull & Magpies” with more adventures on the high seas. There are ska, tunes inspired by ska, celtic, cumbia, and cajun music, a song in French, a song in Irish and more. Cover design and layout Media Rare. Cover and disc illustrations by illustrator and fine artist, Dale Horstman. Shake Those Bones — Bones is another word for dice. Originally dice were made from a specific bone in the knee area of sheep called the talus. Shake those bones = cast dice. 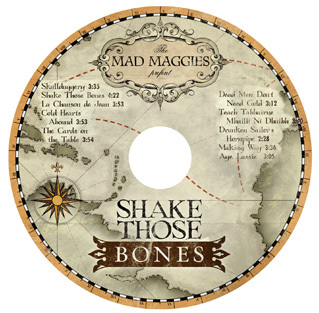 Shake those bones = dancing. No matter what Fate has in store for us we might as well take our chances and shake ’em and roll ’em while we can. La Chanson de Jean (Dark John’s Theme) — love ballad, Jean asks the elements to help him sail as fast as possible to his love. Track 11 is a hidden track on this album. Mags asked Wally to fly free and touch his inner dub master on our version of “Drunken Sailor’s Hornpipe” which he did to great effect. “Shake Those Bones” received two nominations from The Just Plain Folks Awards 2017! In all, we have received 7 nominations from JPF spanning 4 albums.